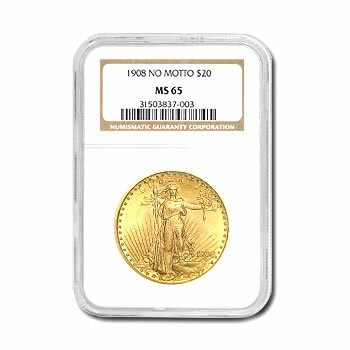 The Saint-Gaudens $20 Double Eagle is considered by many to be the most beautiful gold coin. 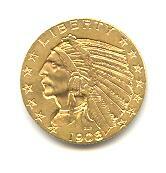 They are one of the most widely collected coins Dates of our Choice, though we will honor your request if possible. Email or call for information on Coin Bezels for our coins or yours. 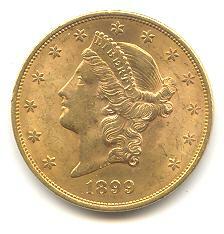 $20 Liberty Double Eagle gold coins are one of the world’s most recognized gold pieces. 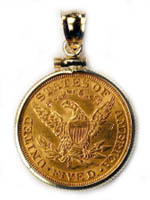 Because the $20 Liberty gold coins were used in every aspect of American economic life, many appear in circulated grades. Dates of our Choice, though we will honor your request if possible.Prices shown are cash prices at spot shown, and will be adjusted up or down for spot when you order. 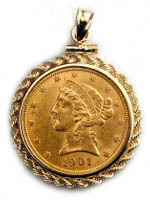 In addition to his famous Double Eagle, Augustus Saint-Gaudens fashioned another design, hailed as one of the most stunning in American coinage--the $10 Indian gold piece, which was to replace the $10 Liberty pictured below. 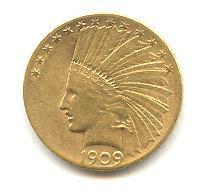 Minted from 1907 to 1933, it is a widely collected gold coin. Dates of our Choice, though we will honor your request if possible. The Liberty Eagle ($10.00) ,because of its convenient size and denomination, was instantly popular and became one of the most circulated coins in U.S. history. The obverse was patterned after the popular 1816 Coronet-type Large Cent, and the reverse is considered one of the most fascinating eagles ever to grace any U.S. coin. Dates of our Choice, though we will honor your request if possible. The Liberty Half Eagle was the only coin of any type or denomination to be struck at all seven mints. They were struck in two types--the ultra-scarce "No Motto," minted from 1839 until 1865 and the "With Motto" (IN GOD WE TRUST) type, struck from 1866 until 1908. Dates of our Choice, though we will honor your request if possible. Considered by many to be one of the most beautiful coins, with its rendition of a proud native American chieftain, the Indian design is much favored as a jewelry item, adorning many necks and fingers. Initially one of the main concerns with this style of coin was that the recessed devices housed disease-carrying bacteria. Thus the public was understandably reluctant to preserve even uncirculated specimens for generations to follow. Furthermore, because Pratt did not choose to use rims to protect the surface of the coin, uncirculated examples are scarce and superb gems are virtually unheard of. Modeled after the Coronet-type Large Cent (1816-1857), Christian Gobrecht's Quarter Eagle design continued unchanged for 33 years, longer than any other design in the history of American gold coinage. The obverse contains a bust of the crowned image of Miss Liberty facing to the viewer's left. The reverse is decorated by an American bald eagle clutching an olive branch and arrows in its talons. Dates of our Choice, though we will honor your request if possible. The same Pratt Indian design, but in two and a half dollar format. Hit refresh button on your browser to refresh chart. Prices have dropped so much, call or email for current quote if you are interested.